Do you need an internal ballast for your regulation? The AQUA XL and the AQUA MEDIUM (slightly smaller than the AQUA XL), are robust float level switches constructed with an internal ballast. Do you need an internal ballast for your regulation? The AQUA XL level regulator and the AQUA MEDIUM level regulator (slightly smaller than the AQUA XL), are robust float level switches constructed with an internal ballast. This particular characteristic distingues them from the SOBA level regulator and SOBA SMALL level regulator models that come equipped with an external, adjustable ballast on the cable. 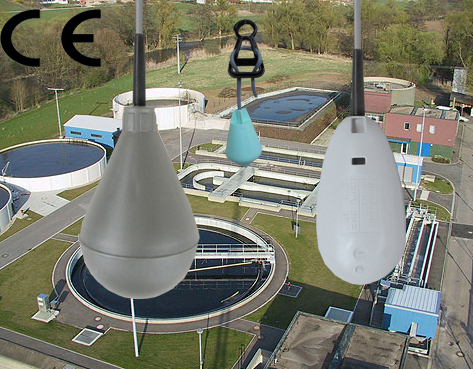 This is also the case (in option) of the BIP STOP float level switch for small pumps, AT120 float level switch for intensive use, ATS165 float level switch for very agitated liquids, and the TUBA float switches which microswitch inside tilts as the liquid level rises, closing or opening an electrical circuit. The AQUA XL level regulator and the AQUA MEDIUM level regulator can be used in all kinds of non-aggressive liquids sewage or wastewater coming from pumping stations, water treatment plants, etc. They can also be used for level control of multiple pumps or as high or low level alarm. Besides, thanks to its volume and weight, the AQUA XL and the AQUA MEDIUM level regulators are able to penetrate the grease layers found on wastewater pumping stations.